MANILA, Philippines – The Civil Service Commission (CSC) released the School and Room Assignments for March 2019 Civil Service Exam – Pen and Paper Test (CSE-PPT) or the Online Notice of School Assignments (ONSA) few weeks before the Professional and Subprofessional Levels eligibility exams. UPDATE March 6, 2019: ONSA is now available! In the most recent CSE-PPT conducted by CSC on August 2018, 22,087 out of 181,985 (12.14%) combined examinees for Professional and Subprofessional levels successfully passed. Checking the room assignments through CSC's Online Notice of School Assignments is fairly easy. Here are the steps. Go to the ONSA page from CSC. Enter the Last Name, First Name and Middle Initial. Put * if no Middle Initial. Put the E-mail address, Mobile Number and Date of Birth using the suggested formats. Select the region to take the CSE. Select the level whether Professional or Subprofessional. Press Submit and voila. You're done! If problems persist, contact the Regional office for assistance. The CSE-PPT (Professional and Subprofessional levels) for the year 2019 is scheduled on March 17, 2019 and August 4, 2019 in NCR, CAR, CARAGA, ARMM as well as all Regional testing centers nationwide. CSE-PPT aims to establish a Register of Eligibles (RoE) from which certification and appointment to first and second level positions in the civil service. This is with exception to those involving practice of profession and/or covered by special laws, provided the eligibles meet the qualifications and other requirements of the positions. Additionally, passers of Bar and Board exams may opt not to take the Civil Service Exam as they are already considered exempted pursuant to Republic Act 1080. CSE-PPT examinees will receive their school/room assignments through the ONSA which is accessible at CSC official website. The contact numbers are available above. Examinees shall bring the following requirements on examination proper. Valid Identification Card – preferable same ID presented during filing of exams, if no valid ID, bring original PSA-issued birth certificate; Notice of School Assignment generated thru ONSA, Application Receipt (if applicable); black ballpen, water or non-alcoholic beverage placed in transparent container. In preparation for the upcoming exam, examinees can visit the assigned school/testing venue before the examination day to be familiar with the location. On the exam proper, CSC reminds examinees to report earlier at the testing venue. Testing centers will be open starting 6:00 A.M.
Examinees must take note of the succeeding additional reminders from CSC. Gates of testing venues will close at 7:30 A.M. Likewise, late comers will not be admitted. Examinees shall adhere to the attire set by the Civil Service Commission. Proper attire shall be worn on the day of exams. Similarly, wearing of slippers, short pants, sleeveless shirt and blouse, or similar clothes are not allowed. To receive regular updates about March 2019 Civil Service Exam as well as other related announcements, you may refer to CSC official website or follow us at our social media accounts via Facebook and Twitter. How can we find our designated room assignment through online? 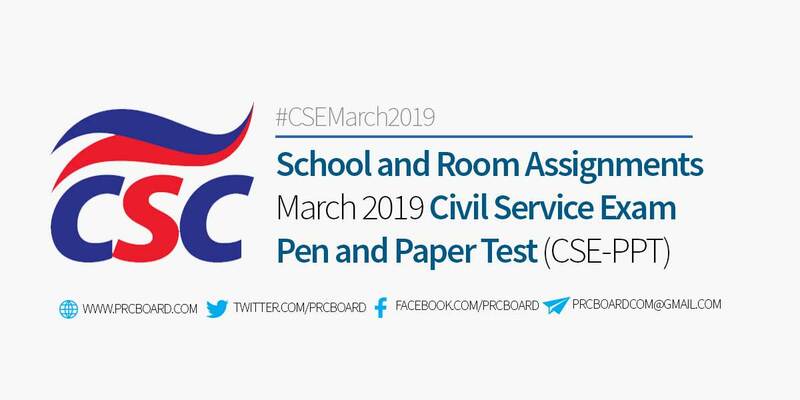 Yes, the list of room assignments for Civil Service Exam March 2019 has been partially released. ATM, Region 4 already posted the RAs for Professional and Subprofessinal levels. For other Regions, it is expected to be released until next week. Keep tuning in at this article as we will regularly update examinees for the rest of CSE-PPT room assignments. To those unable to access ONSA, should the notice of school assignment still be a requirement during the exam? please post the room assignment in this website? NCR Region po ba meron ng school assignment for sub professional po. D ko po makita room assignment ko bakit poh? Please post the names list and room assignment in region 10, cagayan de oro city. Thank you. Mark Adrian C. Enjambre po name ko hope matulungan nyo ako. Ano ano po ang mga school na gagamitin sa manila ?